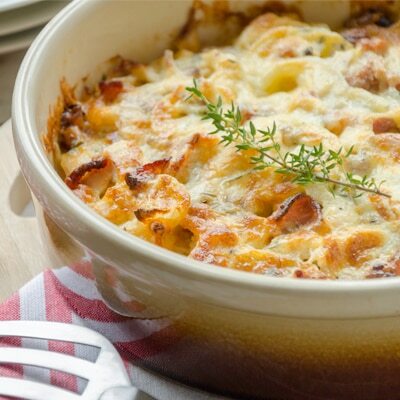 This hearty Potato Bacon Casserole features tender hash browns and succulent bacon pieces. It is a perfect crowd pleaser for brunch or any meal. PREHEAT oven to 350° F. Grease 8-inch-square baking dish. LAYER 1/2 potatoes, 1/2 onion, 1/2 bacon and 1/2 cheese in prepared baking dish; repeat layers. Combine evaporated milk, egg and seasoned salt in small bowl. Pour evenly over potato mixture; cover. BAKE for 55 to 60 minutes. Uncover; bake for an additional 5 minutes. Let stand for 10 to 15 minutes before serving.